Well, it’s the eve of the eve of the biggest holiday on the American calendar. What? Yes, that’s right the eve of the eve . You don’t honestly think that people care a whit about eating turkey and giving thanks , do you? That’s not the American way, after all. Well, okay, maybe the stuffing-themselves-with-turkey part. But the big holiday around these parts is Black Friday, the day when the madding crowds descend on the shopping malls and retail outlets around the country in order to gorge themselves on ridiculously low-priced merchandise—that is, if they can avoid being trampled on the way by the rest of the bargain-seekers. If you happen to be in search of deals this Friday, I wish you the best of luck and bestow the blessings of the Gadgetbox upon you. You might call this week’s edition “America’s Next Top Gadget” (if you choose not to, I won’t hold it against you). With all the high profile gizmos of late, I thought we’d take a look at three contenders for the latest gadget to change it all: Amazon’s play for reinventing the book, Microsoft’s latest attempt to take on the iPod, and finally, my long-awaited shot at super-rock-stardom. In case you’ve been living under some sort of rock, or if you started brining your turkey on Monday, you’ve probably heard about Amazon’s new ebook reader, Kindle, by now. The $399 device features a high-contrast E Ink screen, and a wireless EVDO connection called “Whispernet” that allows you to download electronic books from the Internet without a computer. The device also features the potential for expansion via SD flash memory cards, a weight of just 10.3 ounces, a keyboard, and robust battery life. It’s an intriguing idea, but one that’s been repeatedly tried for the last ten years or so—anybody remember the Rocket Ebook? 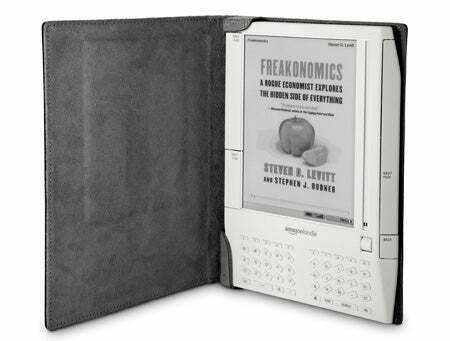 So far nobody’s found a way to build a technological device that trumps the simplicity and elegance of the physical book. Were its only competition sheepskin parchment or the scroll, I’m sure the Kindle would be rocking our world. But as it is, paying $400 just so we can pay an additional $10 to buy a book seems like a bit much to me, especially when I can just buy a book for $20 or—and I know this might sound crazy—take a book out of the library for free . That said, there are some nice advantages to ebooks as a format: not having to worry about finding physical storage for a large collection of books, the ability to search inside a title, and no monthly fees. And by all accounts, the E Ink screen is pretty slick. I’m just not sure if I have room in my life for yet another specialized gadget. While it looks as though the Kindle might be an improvement over previous ebook ventures, it seems about as likely to revolutionize reading as the Segway did transportation. And, if you ask me, Amazon is missing a major opportunity by not calling the downloadable content for their new ebook reader “kindling.” I mean, come on ; how hard would it have been to think of that? It’s the Microsoft way: if at first you don’t succeed, continue throwing money at it. Nobody’s yet managed to construct a device that rivals the iPod in terms of simplicity and ease-of-use, which have ended up being the trumping factors when it comes to music players. Microsoft’s original Zune actually ended up being the closest of the bunch, but the initial model was hampered by a number of issues—like, oh, the color brown . But as I said, that’s not about to stop Redmond. Earlier this month, Microsoft announced the second-generation of Zune players, comprised of several different models, including a $249 version based on an 80GB hard drive and two using flash memory in 8GB ($199) and 4GB ($149) capacities. All three use a new touch sensitive controller called the Zune Pad, which allows for user interfaces somewhat similar to the iPhone’s and, at the same time, responds to clicking on various sections as controls, so you don’t have to look at the Zune to control it. And, if you desire, you can still pick up a 30GB original Zune, though it lacks the Zune Pad. Will version two of the Zune correct the deficiencies of the original model? Well there’s no brown, to be sure, and the company has tweaked the wireless sharing, limiting you to three plays instead of the more byzantine “three plays or three days” rule of the original. They’ve also added wireless syncing, though you can’t yet buy tunes directly from the Zune Marketplace over Wi-Fi, as on the iPhone and iPod touch. The Zune may not be a challenge to the iPod right away, but the fact that Microsoft isn’t giving up the ghost should give even iPod fans warm fuzzy feelings—by continuing to compete, Microsoft will force Apple to remain on its toes. I’ve been enamored with Harmonix’s Rock Band ever since I got a chance to see it played live back at the Penny Arcade Expo in August. I’ve played Guitar Hero a few times in the past, but I didn’t consider myself much of a shredder , to be honest. But ever since I was a wee lad, I’ve harbored a dream of becoming a world-class drummer—and Rock Band , officially released yesterday, is going to help me live that dream. Okay, maybe not, but so far, I have to say that playing the drums is an incredibly rewarding experience. Pounding away at “Gimme Shelter” may have well been one of the high points of my admittedly young life. That’s not to say that the guitar, vocals, and bass are not fun, but the drums is clearly my particular obsession, to our downstairs neighbor’s chagrin. To truly enjoy the game, however, you need the help of friends—it is Rock Band , after all. There’s nothing quite like you and two friends nailing the big rock ending on OK Go’s “Here It Goes Again” for a multi-thousand point bonus. The Band World Tour mode is the highlight of the game, a campaign-based multiplayer that mimics going on tour; create a band with your friends, outfit your rockers with the appropriate threads, instruments, and even tattoos, and you’ll play gigs in cities around the world, earning money and fans as you do so. While the game has a decent song list of over 40 tracks by the likes of The Rolling Stones, The Pixies, Metallica, and Weezer (most performed by the original arists), the rocking doesn’t stop there. A virtual cornucopia of downloadable content will be available, starting this week with tracks from artists like The Police and Queens of the Stone Age and later including full albums from The Who and Nirvana. It seems unlikely I’ll find myself in a real rock band anytime soon—I’m still dealing with the hand cramps and sore calf muscles that come from overindulging in the mere simulation of that old time rock and roll. But if this as close as I’ll ever get, well, it may be just close enough. To those of you readers who will be celebrating Black Friday (or, fine, Thanksgiving ), we wish you the best of luck. In the spirit of giving thanks, I’d like to extend my gratitude to all of you readers who tune in week after week, and especially to those of you that send emails or reply in the forums. I know who you are, and when my army of robotic zombie dogs finally comes through, you will be rewarded, I promise. We’ll see you back here next week for more gadgetry as we ramp up for the most wonderful time of the year .